Rajshri production since its inception in the 60’s with their debut film AARTI (1962) has been famous for making family oriented movies like DOSTI, SAARANSH, HUM SAATH-SAATH HAIN, HUM AAPKE HAIN KOUN, MAINE PYAR KIYA etc. The antagonist in their film is not dark but has shades of grey and who is generally within the family like stepmother, uncle, mother-in-law etc. 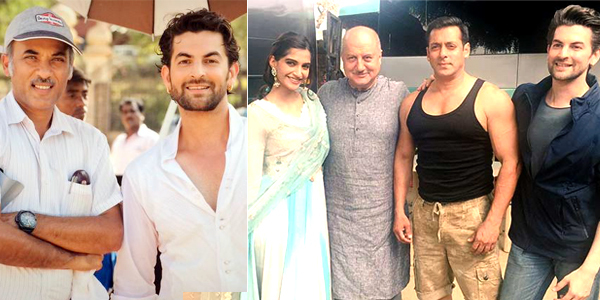 In their forthcoming film PREM RATAN DHAN PAAYO (PRDP) staring Salman Khan and Sonam, the antagonist is played by Neil Nitin Mukesh, who has earlier done a similar role in movie JOHNNY GADDAAR. “While returning in the cab my mother told me, ‘I know you aspire to become an actor when you grow up. Hence I have shown you this film paying such huge amount, particularly because I hope someday when you became a star then I wish you act in such films like the Rajshri productions,” he recalled. “I am quite thrilled as today my mother’s dream of me acting in Rajshri production’s film has finally come true,” he quipped. Mukesh will be seen playing the role of Ajay Singh, younger step brother of Vijay Singh (played by Salman Khan), who is rebellious and jealous of his elder brother.